Chromosomes are made up of nucleoproteins which constitute basic proteins and nucleic acids. 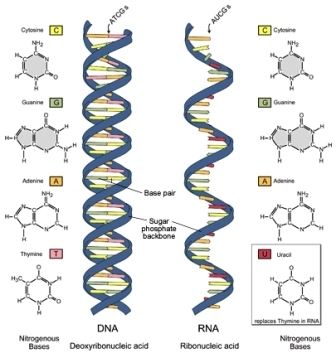 Two kinds of nucleic acids are recognised. Deoxyribonucleic acid (DNA) and Ribonucleic acid (RNA). Nucleic acids are first reported by Friedrich Miescher (1871) from nuclei of pus cells. He called them as nuclein. Nuclein was renamed by Altman in 1889. It usually occurs inside nucleus and some cell organelles. Very little RNA occurs inside the nucleus. Most of it is found in the cytoplasm. Depending on the type, RNA contains 70-12,000 nucleotides. Purine and Pyrimidine bases are in equal in number. There is no proportionality in between numbers of Purine and Pyrimidine bases. Base pairing through hydrogen bonds, occurs in the coiled parts. DNA is spirally twisted to produce a regular helix. The strand may get folded at places to produce a secondary helix or pseudohelix. It cannot normally replicate itself. It occurs in the form of chromatin or chromosomes. It occurs in ribosomes or forms association with ribosomes. The function of DNA is to transfer genetic information from one generation to the next. The function of RNA is to direct synthesis of proteins in the body. DNA transcribes genetic information to RNA. Its quantity is fixed for cell. RNA translates the transcribed message for forming polypeptides. The quantity of RNA of a cell is variable. Renaturation after melting is slow. DNA is only two types: intra nuclear and extra nuclear. Three different types of RNA: m-RNA, t-RNA and r-RNA. Some RNAs are very short lived while others have somewhat longer life. Very nice collection, good luck!! GOD bless you .was so helpful. Very Succinct & Superb! Quite helpful. Bravo for the assiduous research and documentation!! Thanks a lot for the data,,,,really helpful!! Thank u so much.....it helps me alot. What a systematic approach of presenting topics ...thank you for creating this website .its just sooooo useful . Thank you very much. It's really helpful. Good knowledge of DNA and RNA.